This guide, will help you get started in the roadside assistance industry if you are planning to start off in the roadside assistance business. In this service business, you will be a very busy person because you have to perform several services such as towing cars to the nearest auto mechanic shop, repairing flat tires, bringing customers' gasoline, jumpstarting dead batteries and unlocking the cars. To make you win in this kind of business, what you need to have are the most heavy-duty and high-quality materials such as jumper cables, repair tools for flat tires, locksmith tools, gas can, cell phone, and a tow truck. Prior exposure: Your know-how will count a lot in this business. It is a requirement for you to have experience in being a roadside assistant. Buying tools and accessories: If you are quite confident to do the job well, then your next step is to buy the tools that are needed for the trade as aforementioned. In this business, you can choose to do the job yourself or hire employees for performing all the required services. Depending on your funds, you can buy a flatbed tow truck to provide more services to customers having large vehicles. Get ready to accept payment: You need to open a merchant account and buy a POS machine to swipe a credit or debit card. Ways to price your service: The business structure is very important, with a right plan, you will be able to make a substantial amount of money. If the service is required at night, then you can add surcharges. This is the best part of this business when it comes to increasing profits. You will have to do your homework for finding the competitive price to charge for your service in the neighborhood. Calculating profit: Every businessman is always looking forward to finding his ROI. Your total earning minus all your expenses including the interest that you pay towards the loan will give you the profit. If there is a certain employee who had been hired to render service on a night-shift, you need to consider the added expenses. Don't forget to add the bookkeeping expenses if you are outsourcing it. Finally, you will get a profit figure before tax. Finalizing area of operation: Next, you need the coverage area to be defined. By doing this, you will be able to cut costs on gasoline expenses. To make sure that you adhere to the rules and regulations in your area in operating this kind of business, you need to carefully check your local police department. You also need to ask them on how to add your business to get listed on the call list. With this, they can contact you when they need to have a roadside assistance during accident scenes. Beating the competition: Since this is an in-demand business, you also need to take into consideration your competitors. Check out how they advertise their business and what additional or special services they provide. Advertisement: Next, you have to advertise your business so that you can get more leads and conversions. How much does it cost to start a roadside assistance business? The major cost involved in starting this business is buying a towing truck. Depending on a new/pre-owned vehicle the rate is going to vary from $10,000-$200,000. Other formalities including insurance, tools, and paperwork are going to cost $7,000-$10,000. How to get a business license for roadside assistance? 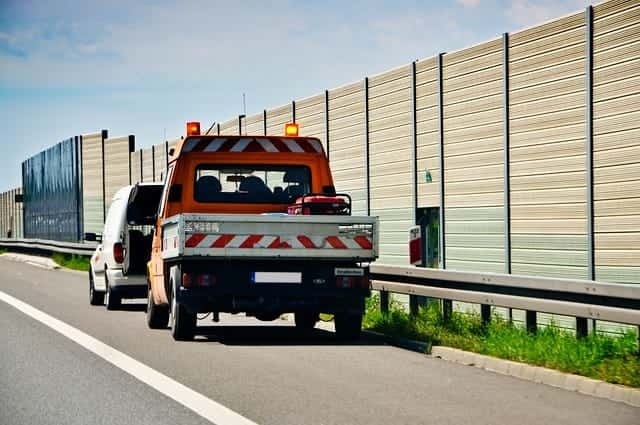 If you finalized to provide towing services, then you must procure 3 licenses for it along with all other local licenses for a business. For local licenses, you must call your clerk’s office for more information. For towing services, you need the following licenses. Indictment management, this is required by a tow truck to tow a vehicle when the request is initiated by the law enforcement officer. Privet property, this is required by a tow truck to tow a vehicle when the request is initiated by parking facility owner. Consent tows, this is required by a tow truck to tow a vehicle when the request is initiated by the vehicle owner. Do you need a commercial auto liability insurance? Yes, you need a commercial insurance even if you are not planning to tow a car. One can mess up the vehicle while replacing a battery or tire, so major auto insurance companies will need your business to have a commercial insurance to work with them. You can check out some comments on reddit.com. Average insurance cost per year will be around $3,000. How much does a roadside assistance business owner make? Earning varies with location, normally an owner makes in a range of $25,000 - $40,000 per year. A road side assistance technician's salary vary from $11/hr to $14/hr. Hi, i'm looking to start a road side assistance company.please assist! What do you need to start a roadside assistance business I have all the tools. I been doing roadside for over a year now. I am currently a Texas Peace Officer. Before I came into the law enforcement field I was a auto body and paint ASE/ICAR Master technician. Before I became a technician I had been working with my uncle at his tow truck company (Valley Towing & Storage) located in Brownsville, Texas for more than thirteen years. I had been working part-time on vehicles for extra cash. But now after I read this article it really motivated me to start my own roadside assistance company. I got my permits and insurance. I recently started on my own, using my personal pickup truck and tools I already had.. It felt great when I got my first service call and helped a motorist in need. Thank You for your support and knowledge. Yours truly, RVG Roadside Assistance Los Fresnos, Texas 78566. I am in Tucson, az. my fiancee and I want to start a RA company. we aren't sure what type of permits, license and insurance we need. I am in Columbus Ohio and trying to start a roadside assistance business. How do I find out about permits license and insurance to get started? Hi how do you hook up with AAA OR CROSS COUNTRY? Also what permits and insurance do I need and what's the credit card thing? Hello, I live in Orangeburg, SC. I already have a truck, all I need are the right tools for the trade. What do I need. How can I get with AAA? What kind of licenses or insurances do I need? would like to open RoadSide Assistant. Know pretty much everything about this, except where can i get license or how to open it. Please assist. Thank you! What kind of licenses do I need in order to open Roadside assistant Membership in Northern California like AAA, Allstate etc? AC. I live in charleston sc i've been doing roadside 4 years now i would like to know how to get insurance companies to use me for their calls and if you know anything about cross country recruiting i spoke to a recruiter a couple of years ago but didnt have the insurance. I have all the tools needed to be a roadside assistant tech. I live in Lansing, MI. Looking for a job. I recently started a roadside assistance business and went to the motorclub websites and they all have application packages to download and fill out and fax to company. All I needed was a little more liability insurance on my car and faxed each motorclub a insurance certificate with them listed on bottom of form. Your insurance company should be able to fax it for you. I would like to start road side assistant business in dearborn Michigan. I have all the tools for job and I was working in this field for 2 years with my brother in philadelphia but because I moved to dearborn michigan I need a help how to contact the insurance companies to receive a phone call. I'm in montgomery county md and i'm tying to start my own business and i have the hook ups with the insurance companies and i'm looking for a partner. Hi I am located in boston and had a problem with my car which i called a road side assistance and ever since then i have been thinking of going into the business, I need to know step by step details on how to start the business, the licensees, permit and insurance. I would also like to know how best to market the company and get calls for jobs. Thanks. I live in Atlanata Ga I have no experience but just want to start my own business. I want to know if I just use my car for jumps, tire changes, locksmith, and gasoline. will I have any success? I live in Allen Texas .The article was very helpful to me. What kind of business plan do I need to prepare for my business before getting started? All I have to get started is heavy duty jumping cables, container for gasoline, and changing flats. I would like to add scanning to check for check engine light. do I need permit-license for road side service. new ford f150 4x4 pickup all the tool air pump and generator. Hi i live in Boston Massachusetts and i currently work with a roadside assistance company and i have all the tools, and would like to start up my own roadside assistance company but would like to know what kind of permit, license and insurance that i need and how to get calls from different insurance company or motor clubs. Thanks. Hi:i live in hilo and kona and i want to start a roadside service covering kona and hilo surrounding area.with roadside service, lockout, tire change, jump start, gas delivery 24hr. i dont have funds at this time to purchase a wrecker or rollback. but hope in the near future i can run a full time road service i have 5yr experience and want to hookup with AAA roadside service and how to get calls from different insurance company or motor clubs. thank you. Hi. my name is richard and i need help in running a business in roadside service, RKservice. thank you. Roadside & Towing since 2005 as owner operator to about a dozen insurance/motor clubs. I can guide u but I also consult on a hire basis. Tip of the day - provide niche services in a niche area can be golden, just keep your expenses low. My name is Lawrence Miliner I live in dayton ohio I have very little experience in roadside assistance business. I'm looking to start my business soon. I meet most of the requirements .what I lack is the knowledge of how to go about getting with companies like AAA and how to price potential customers. I really need your help. Hi I want to cover the NewYork queens area and I have experience in this field and I have the tools and the experience in this field. I can do fuel deliveries, tire changes, jump starts, lockout service and batteries. hi my husband wants to start a little business not towing only flats, battery charging, jumpstart, only the basic lock outs and want to know how to get started on that what type of insurance is needed and how to get a contract with AAA or farmers etc can u please let me know. I already do roadside for a company for basically pennies! I am dedicated & got what it takes physically. Be sides tools, i just dont know how to start my company from a legal standpoint. Do i need some kind of special license( how do i get contracts, where do i go for these answers? I got tools! Please contact me I am interested in starting my own road service business. In Texas and need help/leads/info to get started with my roadside assistance business. Grand Rapids, Michigan. I would !!LOVE!!! to start a Roadside assistance club. How would I go about going into each insurance agency? I have been doing roadside for 2 years now, have all equipment and necessary experience. Any information helps, I can be reached by email at KevinJLuyk@yahoo.com Thanks and looking forward to reply's! i live in chicago, il i would like to start a roadside assistance co, i have a van with all the equip for jump starts, tire change, gas, lock out, i have commercial ins for the van do i need only workers comp/ins only. to work with motor clubs. I live in Atlanta,GA and I will like to know step by step details on how to start my own roadside assistance business. I will only be focusing on tire changes, lock outs, jump starts, and fuel delivery. I would like to know how I can connect and get calls from AAA and all the major insurance companies. I will also like to know how best to market the company and get calls for jobs. I need someone to call and help my Roadside company to pick up. I want to know how I can get contract from big company to get my company going. Please feel free to call me at 7862587621, again thank you for your time and understanding. I'm in the process of starting a roadside assistance company. However, the only thing I have no experience in nor the funds to obtain is a wrecker. How will this affect my business in the short term? I'm thinking of opening up my own roadside/general assistance company for Saratoga county and the surrounding areas and counties. I don't have enough money for a wrecker, so I was wondering if it would be a good idea to offer roadside assistance services along with general services that are a priority to people but not as much as a priority to send fire and EMS personnel such as lock outs, etc. So what the average income of an roadside biz? Looking to start my own roadside assistance company. I'm a diesel mechanic I would like to service trucks and cars. Someone point me in the right direction to get started. I am looking in to starting a roadside assistance business (no tow truck). Been to City Hall here in San Jose Califonia but they have no information for this business other than just a City license/permit. Does anyone know what if anything ells is needed for Lockouts here in San Jose California? Your help will be greatly appreciated. By the way I have experience in this field, used to be a tow truck driver, now just want to do the roadside assistance for myself with out towing! Thanks again. I am trying to start a family owned and operated Roadside Service Company. I have over 5 years experience and in a great location in Florence ,SC. I would be covering the PeeDee areas. Location is perfect. I-20 starts in Florence and I-95 runs straight through Florence as well. We get a lot of beach traffic and the clients are pretty much endless. I love helping families and being able to do a great service for people who really appreciate the service. I have the tools and the know how on every thing when it comes to getting people back on the road with a peace of mind. I need help networking and letting people know we are out here... we can get there quick...and we can get the job done. Please those who have info on how to help grow my passion for this type work please email me turbobenjy1@gmail.com.... cell#843-206-1274. ty in advance and GODspeed. where do u get on a preferred vendor list? I have a unlimited towing up $100.00 doesn't matter what car you tow in your family you can do a lot with this. we have all the benefits that are more than others . call me #281.407.1864 Mark .... text me why get on a vendors list just sell the membership to the customer. I will like to know how to start my own roadside assistance in vacaville Ca. thanks! I am starting a RA business in Nj. any information will be helpful, partners needed too.